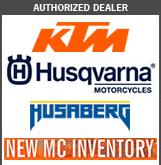 For use on motorcycle and ATV air filters. If you hate to clean foam air filters with gas or harsh solvents, No-Toil filter treatment is exactly what you need. 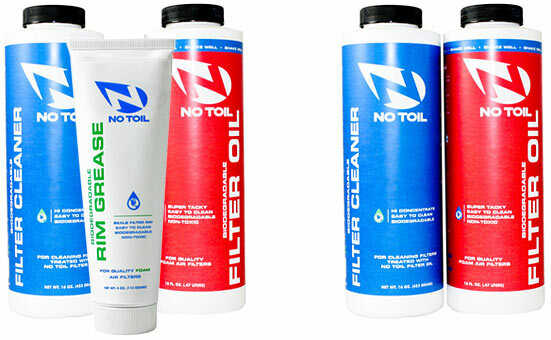 No-Toil is a revolutionary engineering breakthrough in air filter maintenance. Using only enviro-friendly plant materials, we've created a super-tacky, high air-flow, high performance air filter oil. Easy to clean a filter treated with No-Toil foam filter oil. Biodegradeable, filters can be washed right in your sink or washing machine without any hazardous waste. Its super tacky design traps even the smallest dirt particles. Cleanup is a snap and no mess! There's no need for gasoline or solvents. The oil is waterproof and won't come off with water alone. Instructions: Simply dissolve high-concentrated No-Toil Filter Cleaner in water, immerse dirty filter, agitate for 30 seconds or more, rinse and you're done. Empty dirty water down the drain or dump it on the ground at the races. You will not harm the environment or septic systems. When finished, you will notice that your filter looks "brand new"; clean, your hands are clean, the bucket or sink is clean, and your hands don't smell like gas! Even though you're cleaning the filter in water, the filter oil will not come off with water alone. No-Toil is 100% waterproof. Ride with peace of mind through rivers, puddles and creeks.